SYDNEY, AUSTRALIA - FEBRUARY 02, 2014: Unidentified people relax in front of Sydney Harbour Bridge. The bridge is the tallest steel arch bridge measuring 134m from top to water level. 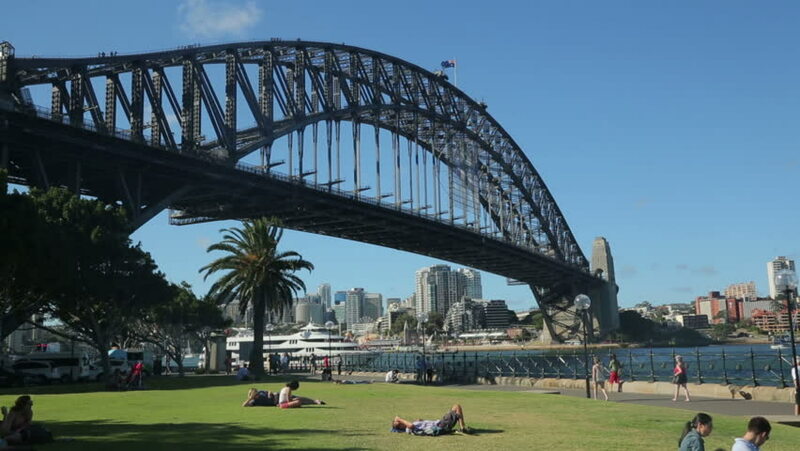 hd00:13SYDNEY, AUSTRALIA - FEBRUARY 02, 2014: Unidentified people relax in front of Sydney Harbour Bridge. The bridge is the tallest steel arch bridge measuring 134m from top to water level. 4k00:16SYDNEY, AUSTRALIA - SEPTEMBER 03, 2016: Harbour bridge with timelapse of cloud movement during sunrise moment with pan left and right view.